Introduction: The Vasoactive Intestinal Peptide (VIP) is expressed and secreted by neurons innervating primary and secondary immune organs such as lymph nodes. VIP is a potent neurotrophic factor. It causes vasodilation, lowers arterial blood pressure, and relaxes the smooth muscles of trachea, stomach and gall bladder. VIP also modulates several T-lymphocyte activities including motility, cytokine production, proliferation and apoptosis. VIP exerts its biological activity by binding to two closely related class II G-protein-coupled receptors (VPAC-1&2). Beside this VIP has its own receptors VIPR1&2. The VIP receptors (VIPR) are integral membrane proteins mainly expressed in lung, liver, kidney, heart and placenta. They belong to the family 2 of G-protein coupled receptors. The expression of VIPR is regulated by multiple transcription factors including VIPRRP. OriGene Technologies offers a panel of monoclonal and polyclonal antibodies to VIPR1/2 suitable for immunological detection methods like immunohistochemistry, flow cytometry or Western blotting. Western blotting of Mouse (lane A) and Rat (lane B) Small Intestine lysate using anti- VIPR1 antibody Cat.-No. 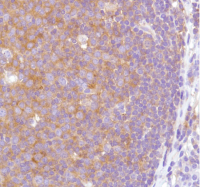 AP32928PU-N.
Flow cytometric analysis using anti-VIPR1A antibody Cat.-No. AM33238PU-N in A431 cells (green) compared to negative control of rabbit IgG (blue).